As you sleep, bodily fluids build up around the eyes, resulting in eyelid swelling when you first wake up. According to "Spavelous Weekly Spa Magazine," puffiness is usually reduced by mid-morning as gravity begins to drain away the excess fluid. Additionally, there are also a few home remedies you can try to reduce the swelling. Although puffy eyes may not be particularly attractive, in most cases they are not a sign of a serious medical problem and may be prevented by making changes to your diet or daily routine. 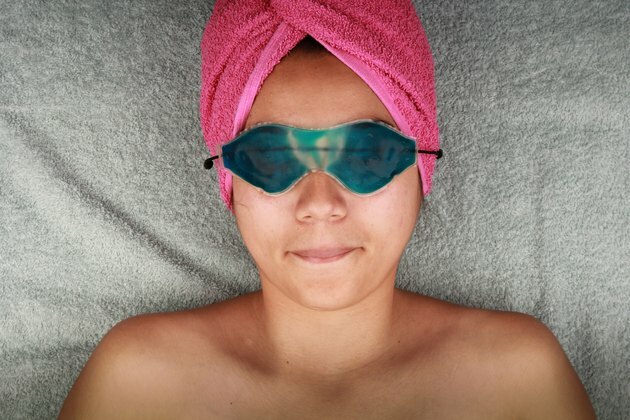 Apply a cold gel eye mask or a bag of frozen peas to the eyes in the morning. Close your eyes and keep the mask or peas on your eyes for at least 10 minutes before removing. Pour a glass of milk and add a few cotton balls to the glass. 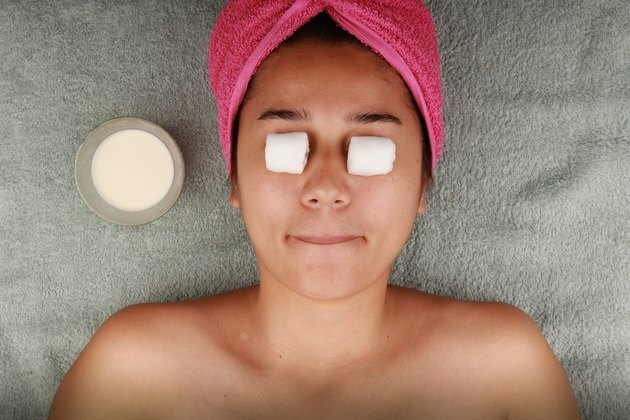 After squeezing out the excess milk, place the cotton balls over your eyelids. In addition to soothing your swollen eyelids, the milk may also help reduce dark circles under the eyes. Use cucumber or apple slices or grated potatoes on your eyelids. Cool these foods before applying, and keep on your eyes for 10 to 15 minutes to help reduce morning puffiness. 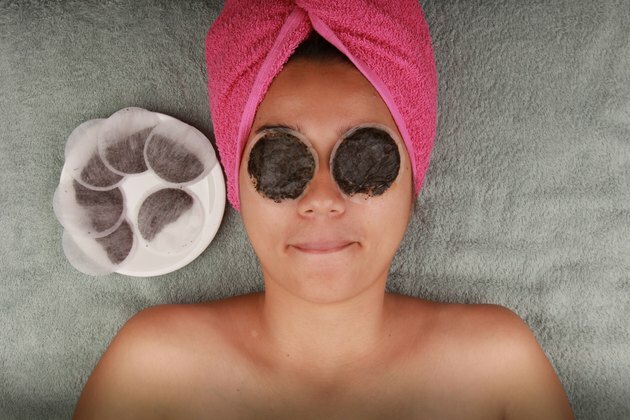 Put a tea bag on your eye to help constrict swollen blood vessels in the eyelids. Any kind of tea bag can be used. Wet the tea bag and place it in the freezer or refrigerator for 15 minutes before applying. Take allergy medication if you have allergies that affect the eyes. Keeping a steady amount of medication in your body can help lessen puffiness and reduce the possibility that puffiness will become a chronic problem. Use extra pillows at night and sleep on your back. Both of these things will help prevent fluid from accumulating around your eyes. Limit your salt intake if puffy eyelids are a problem. If you eat too many salty products, you may begin to retain fluids, which may contribute to the build up of fluids around your eyelids. Completely remove eye makeup before going to sleep. If you sleep wearing makeup, you risk irritating your eyes, which can cause redness and swelling of the eyelids. See your doctor if your eyelids are puffy and you experience tearing, burning, light sensitivity, itching or redness in the eyes, dry eyes, eye crusts or a feeling that you have something in your eye. These symptoms could be signs of blepharitis, according to the National Eye Institute. Blepharitis is an eyelid inflammation that is treated with a strict eyelid hygiene routine and antibiotic or steroid eyedrops if necessary. 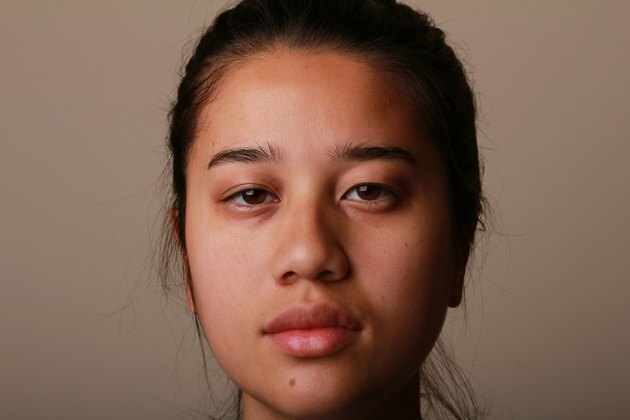 Other conditions, such as thyroid problems or eye or kidney infections, can also cause swollen eyelids.